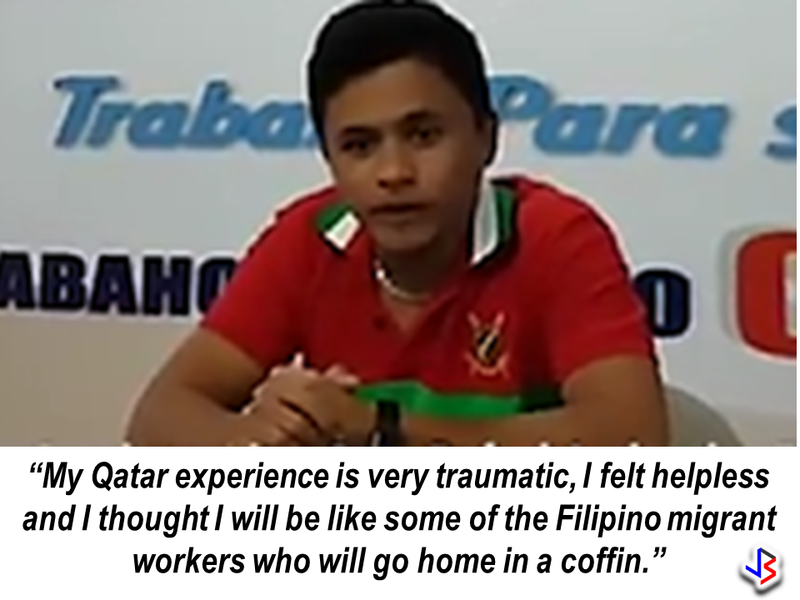 A former OFW who worked as a gypsum installer in Qatar in 2014, he suffered health problems due to unfavorable working condition and severe overwork. After the company’s alleged refusal to provide him assistance and paid sick leave, as well as to cover his medical fees, Rafael Alejo Ambrad, 26, resigned on March 2015. 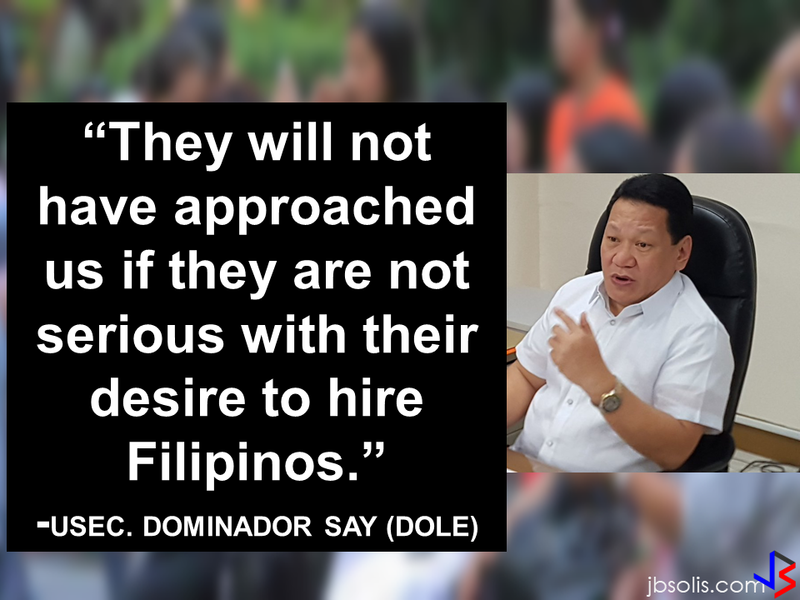 He then sought the help of the National Labor Relations Commission (NLRC) to file a labor case against the recruiter and his former employer, Medtel Company. 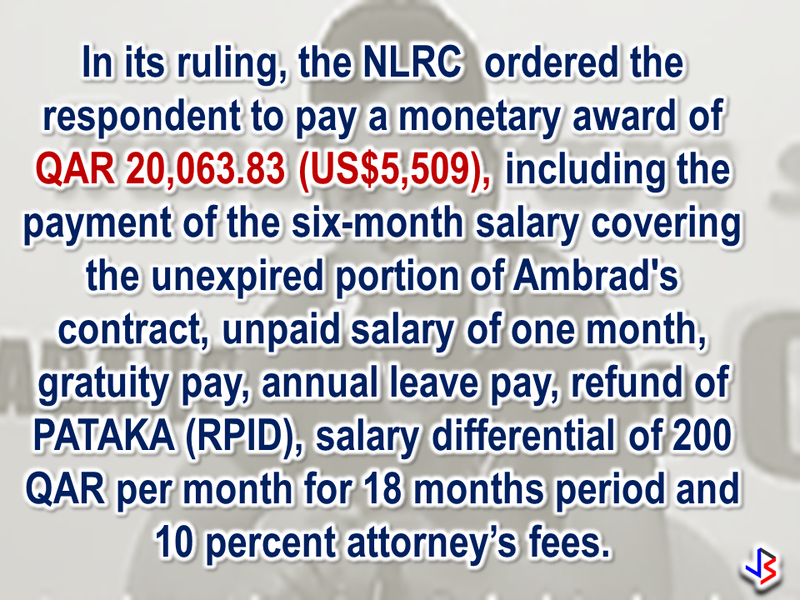 After a year, the NLRC ruled in favor of Ambrad who had to stop working due to permanent injury caused by overwork.He is from Cebu, he went to Qatar to work but due to lumbar sprain that puts him to experience a lot of pain, he had no choice but to resign. A statement from the Associated Labor Union (ALU), one of the groups that helped Ambrad pursue his labor case, said the OFW's condition meant he could no longer lift heavy objects and thus could never work in construction again. According to Ambrad, on one occasion, he was forced to do five days’ worth of work in only two days with only one helper, adding the job would normally require at least four workers. He said he also wasn’t provided a lifting device by the company. However, according to the NLRC, under the circumstances Ambrad’s resignation amounted to an illegal dismissal, noting that the respondent continually ignored his medical condition. In a Youtube video taken down by the uploader for unknown reason, Ambrad related his ordeal being an OFW in Qatar. "Good morning, I am Rafael Ambrad, a Filipino. I'm twenty-six years old, former OFW from Qatar and working as a gypsum installer. In the construction, we know that the job is not easy, but what happen to me, my human right has been abused by my employer, the Medtel Company. Just imagine, when we work, we are supposed to have safety precaution, and they are violating it. Our works demand to carry heavy things to be installed. But we are not being provided with lifting devices or even additional manpower. That's why in one year and a half, I work there for six months, that's where I got my "Lumbar Sprain Disease" and my back hurt. And my physician told me that I could not perform my jobs as a gypsum installer or do any heavy lifting. When I was there, I visited our office to file my resignation, as per my physician's advice, if I continued my work with my present condition, he said my broker back might be permanent. Our company does not allow us to go home, they rally want my presence at work. I'm losing hope. I fear that when I go home in the Philippines, I might be in a close casket. They are the people who are willing to provide assistance to the OFW's when they needed it the most, especially in other countries. Whatever our job there, for instance, I myself is just a humble carpenter, still their support is all the way. Like my transportation expenses, going to the hospital, visiting the legal office, embassy, he is the one helping me... the BWI. And when I got home in the Philippines, they refer me to one of their associations... this is ALU that help me together with BWI that provided me with a lawyer so I could file necessary legal case against Medtel company and my recruiter... the Admiral agency. And with God's grace, we won the case, that almost took one year for me to wait for the decision, we won. I would like to thank the Lord and also the BWI together with ALU, thank you very much, sir. And for my fellow Filipino working abroad, if you think your right is being violated or abused, your dignity has been suppressed by your employers, don't lose hope because there are people who are willing to support you, especially the BWI. They are the organization with a big heart who are willing to protect the OFW.